26 February 1955: Although it was his day off, North American Aviation production test pilot George Franklin Smith stopped by the office at Los Angeles Airport (today, known as Los Angeles International airport, or simply “LAX”, its international airport identifier). 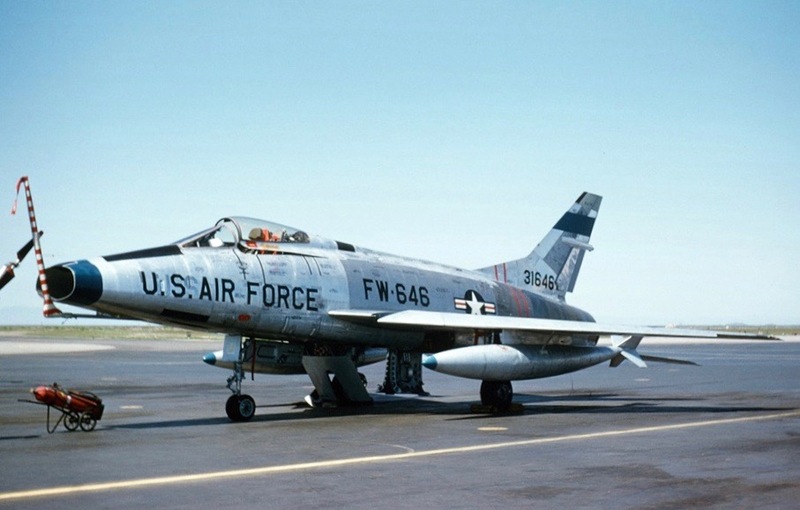 The company’s flight dispatcher told him that a brand-new F-100A-20-NA Super Sabre, serial number 53-1659, was sitting on the flight line and needed to be test flown before being turned over to the Air Force. Smith was happy to take the flight. He departed LAX in full afterburner and headed off shore, climbing to 35,000 feet (10,668 meters) over the Pacific Ocean to start the test sequence. But it was quickly apparent that something was wrong: The flight controls were heavy, and then there was a hydraulic system failure that caused the Super Sabre pitch down into a dive. 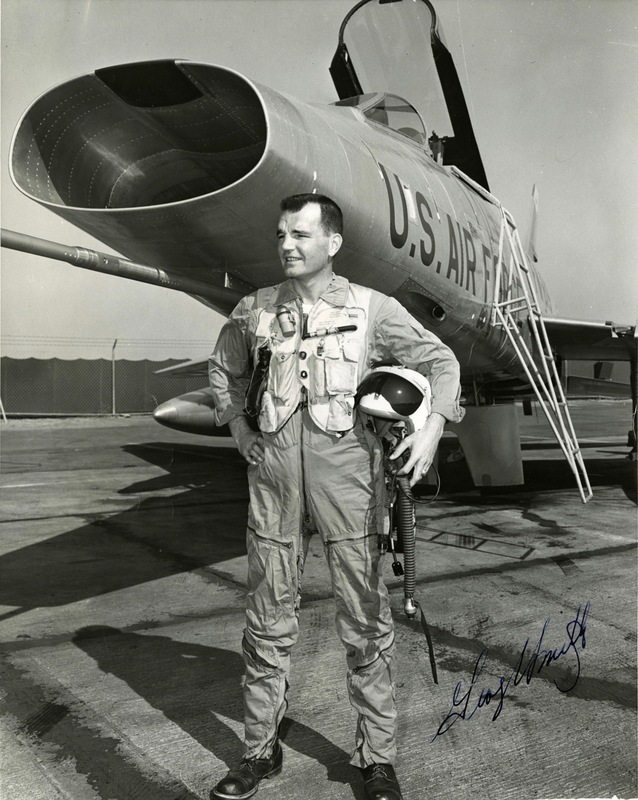 Smith couldn’t pull it out of the dive and the airplane’s speed rapidly increased, eventually passing Mach 1. 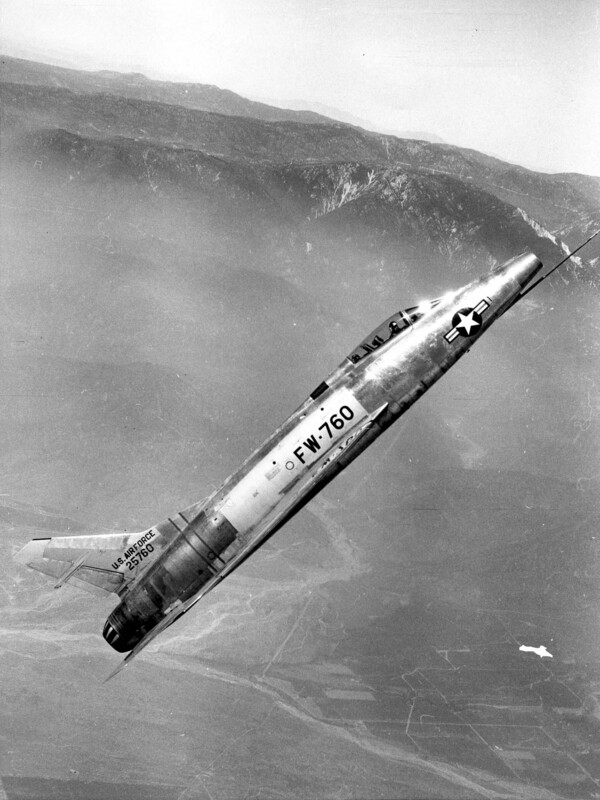 Smith was unable to regain control of the F-100. He had no choice but to bail out. 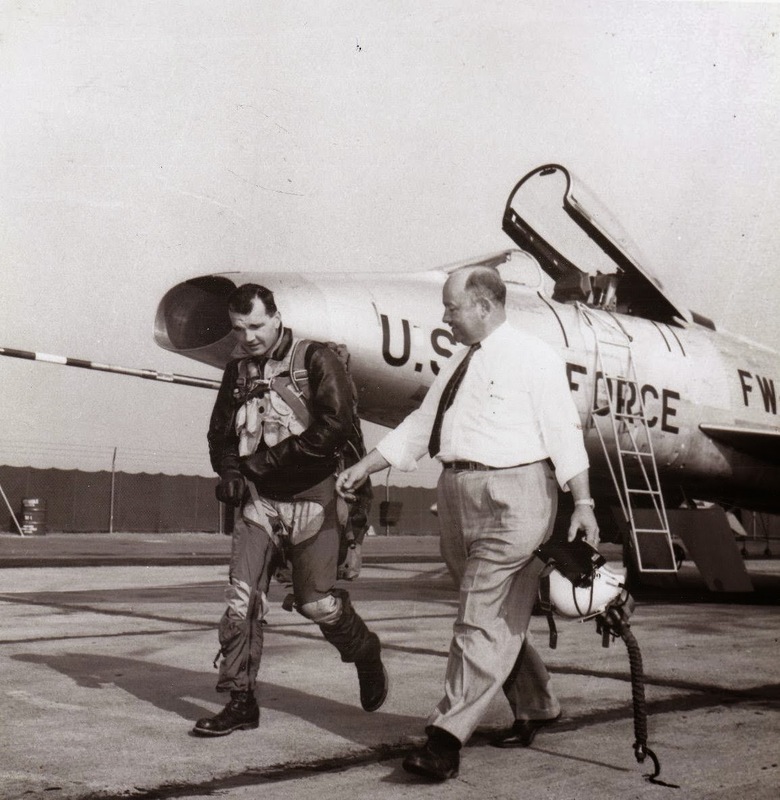 As he ejected, Smith read the instruments: the Mach meter indicated Mach 1.05—785 miles per hour (1,263 kilometers per hour)—and the altitude was only 6,500 feet (1,981 meters). The force of the wind blast hitting him as he came out of the cockpit knocked him unconscious. Estimates are that he was subjected to a 40 G deceleration. His parachute opened automatically and he came down approximately one-half mile off Laguna Beach. Fortunately he hit the water very close to a fishing boat crewed by a former U.S. Navy rescue expert. 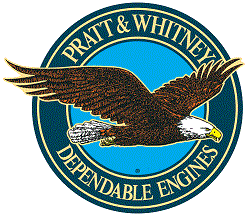 The F-100 dived into the Pacific Ocean approximately ¼-mile (0.4 kilometers) offshore between Dana Point and Laguna Beach. George Smith was unconscious for six days, and when he awoke he was blind in both eyes. After four surgeries and seven months in the hospital, he recovered from his supersonic ejection and returned to flight status. The North American Aviation F-100 Super Sabre was designed as a supersonic day fighter. 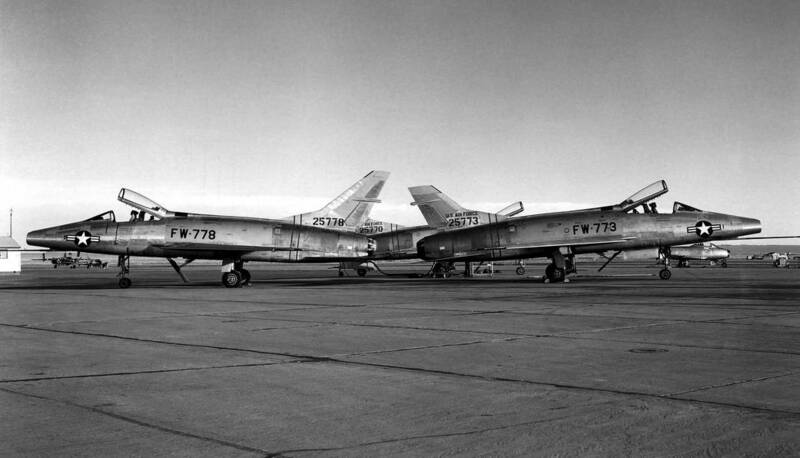 Initially intended as an improved F-86D and F-86E, it soon developed into an almost completely new airplane. The fuselage incorporated the “area rule,” a narrowing in the fuselage width at the wings to increase transonic performance, similar to the Convair F-102A. The Super Sabre had a 49° 2′ sweep to the leading edges of the wings and horizontal stabilizer. The ailerons were placed inboard on the wings and there were no flaps, resulting in a high stall speed in landing configuration. The horizontal stabilizer was moved to the bottom of the fuselage to keep it out of the turbulence created by the wings at high angles of attack. The F-100A had longer wings and a distinctively shorter vertical fin than the YF-100A. The upper segment of the vertical fin was swept 49° 43′. The F-100A Super Sabre was 47 feet, 1¼ inches (14.357 meters) long with a wingspan of 36 feet, 6 inches (11.125 meters). 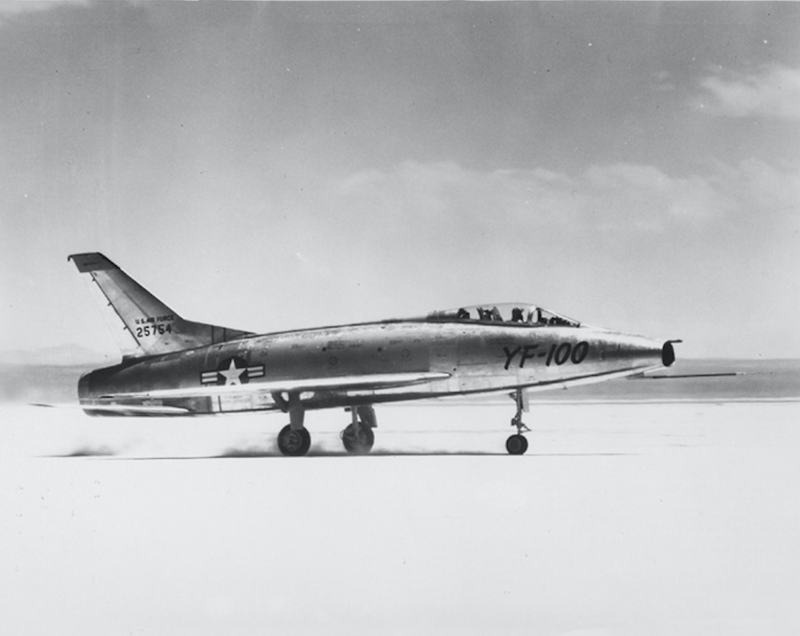 With the shorter vertical fin than the YF-100A, the initial F-100As had an overall height of 13 feet, 4 inches (4.064 meters), 11 inches (27.9 centimeters) less than the YF-100A. The F-100A had an empty weight of 18,135 pounds (8,226 kilograms), and gross weight of 28,899 pounds (13,108 kilograms). Maximum takeoff weight was 35,600 pounds (16,148 kilograms). 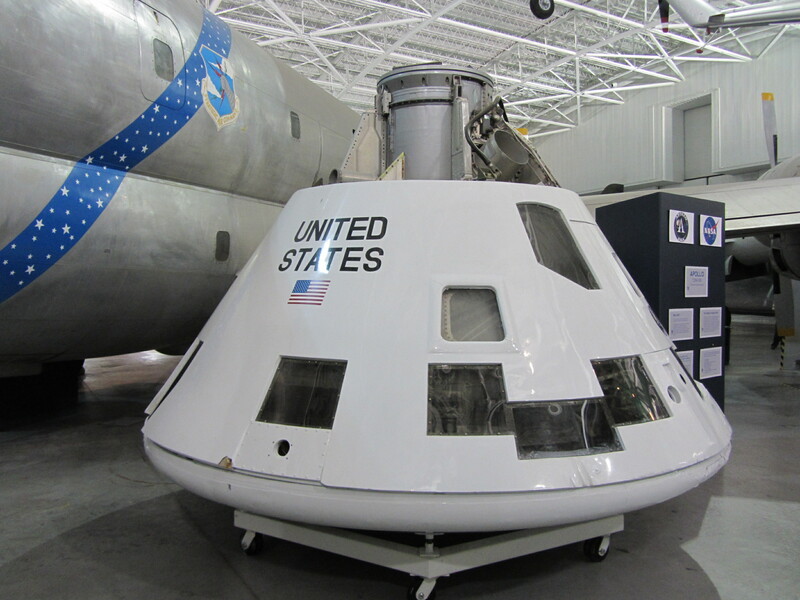 It had an internal fuel capacity of 755 gallons (2,858 liters) and could carry two 275 gallon (1,041 liter) external fuel tanks. 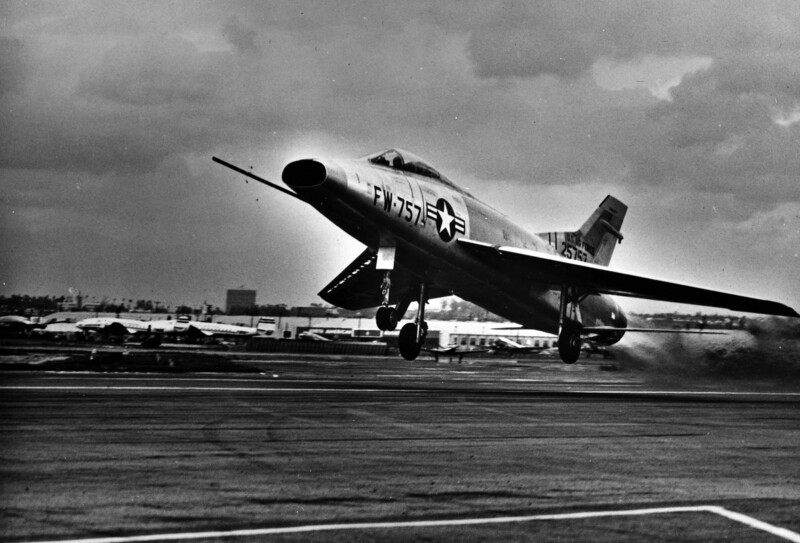 The early F-100As were powered by a Pratt & Whitney Turbo Wasp J57-P-7 afterburning turbojet engine. It was rated at 9,700 pounds of thrust (43.148 kilonewtons) for takeoff, and 14,800 pounds (65.834 kilonewtons) with afterburner. Later production aircraft used a J57-P-39 engine. The J57 was a two-spool axial flow turbojet which had a 16-stage compressor, and a 3-stage turbine. (Both had high- and low-pressure stages.) The engine was 15 feet, 3.5 inches (4.661 meters) long, 3 feet, 5.0 inches (1.041 meters) in diameter, and weighed 4,390 pounds (1,991 kilograms). The Super Sabre was the first U.S. Air Force fighter capable of supersonic speed in level flight. It could reach 760 miles per hour (1,223 kilometers) at Sea Level. (Mach 1 is 761.1 miles per hour, 1,224.9 kilometers per hour, under standard atmospheric conditions.) Its maximum speed was 852 miles per hour (1,371 kilometers per hour) at 35,000 feet (10,668 meters). The service ceiling was 44,900 feet (13,686 meters). Maximum range with external fuel was 1,489 miles (2,396 kilometers).